Posted on June 4, 2014 by J. At first blush, you might think that the actress who said this hasn’t got a clue about her character. I mean, these are polar opposites, right? They can’t possibly both be right in the same scene. Actually, her instincts are correct. The scene is from Agnes of God, pages 23 to 25. It’s a scene between Agnes and the Mother Superior, two years before Agnes’ pregnancy. Agnes has stopped eating, because she believes saintliness requires her to be skinny, and she wants to suffer as the saints do. The Mother Superior is worried about her health and wants her to eat. 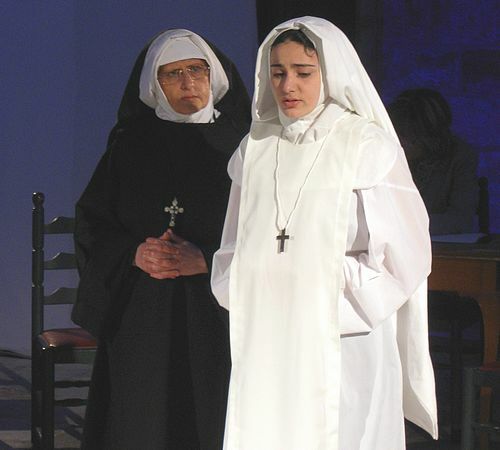 Agnes is bound by her vows to obey the Mother Superior, who is also a surrogate mother to her. But she also feels that she has been instructed by God to lose weight, that unless she does so, he will be angry with her. She won’t let the Mother Superior overrule God’s instructions. “They’re adjectives,” she finished for me, shaking her head, vexed at falling into the trap again. Listen, it’s okay to come up with adjectives and emotions when you are first talking about a scene. That’s what we respond to as human beings. The problem comes when we can’t move past them and we use them as the primary guidance for how we play the scene. No matter how good your instincts are, unless you can build into those emotions by discovering the character’s history and what they want most, playing the emotions will be general and superficial. You need to clearly understand why THIS particular character is [insert adjective] at THIS particular moment in her life. So once you’ve identified the emotions or the adjectives that seem appropriate to you, simply translate them into verbs. As I’ve mentioned before, you do this by asking, “Why would I be submissive?” The answer? “Because I’m a nun, and I have to do whatever my Mother Superior says.” The verb? To obey. “Why would I be aggressive?” “Because she is trying to make me do something that I know is wrong, that God would hate. I can’t let her force me to eat.” The verb? When I asked the actress to tell me what the scene was mostly about for her, she named her verb in response to the idea of being aggressive: To escape. When you can find contradictory motivations like these, scenes can become electric as you go back and forth between two opposing needs in one person. On the one hand, I have to obey her, on the other hand, I have to resist her power and do what I know is right. The conflict is no longer just between Agnes and the Mother Superior, it is also within Agnes herself. The tension of what is going on onstage just tripled. This entry was posted in Acting, Emotions, Rehearsing, Script Analysis, Verbs and tagged Acting, acting technique, Actor, Community Theater, Rehearsing, Script Analysis. Bookmark the permalink.